Amongst hipster start ups in the tech industry Bitcoin has been a thing for a while. As one of the more elderly members of this community I wanted to understand a bit more about it. 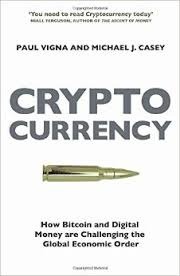 Cryptocurrency: How Bitcoin and Digital Money are Challenging the Global Economic Order by Paul Vigna and Michael Casey fits this bill. Bitcoin is a digital currency: the Bitcoin has a value which can be exchanged against other currencies but it has no physical manifestation. The really interesting thing is how Bitcoins move around without any central authority, there is no Bitcoin equivalent of the Visa or BACS payment systems with their attendant organisations or central back as in the case of a normal currency. This division between Bitcoin as currency and Bitcoin as decentralised exchange mechanism is really important. Conventional payment systems like Visa have a central organisation which charges retailers a percentage on every payment made using their system. This is exceedingly lucrative. Bitcoin replaces this with the blockchain – a distributed ledger in which transactions are encrypted. The validation is carried out by so-called ‘miners’ who are paid in Bitcoin for carrying out a computationally intensive encryption task which ensures the scarcity of Bitcoin and helps maintain its value. In principle anybody can be a Bitcoin miner, all they need is the required free software and the ability to run the software. The generation of new Bitcoin is strictly controlled by the fundamental underpinnings of the blockchain software. Bitcoin miners are engaged in a hardware arms race with each other as they compete to complete units on the blockchain, more processing power equals more chances to complete blocks ahead of the competition and hence win more Bitcoin. In practice mining meaningful quantities these days requires significant, highly specialised hardware. Vigna and Casey provide a history of Bitcoin starting with a bit of background as to how economists see currency, this amounts to the familiar division between the Austrian school and the Keynesians. The Austrians are interested in currency as gold, whilst the Keynesians are interested in Bitcoin as a medium for exchange. As a currency Bitcoin doesn’t appeal to Keysians since there is no “quantitative easing” in Bitcoin, the government can’t print money. Bitcoin did not appear from nowhere, during the late 90s and early years of the 20th century there were corporate attempts at building digital currencies. These died away, they had the air of lone wolf operations hidden within corporate structures which met their end perhaps when they filtered up to a certain level and their threat to the current business model was revealed. Or perhaps in the chaos of the financial collapse. More pertinently there were the cypherpunks, a group interested in cryptography operating on the non-governmental, non-corporate side of the community. This group was also experimenting with ideas around digital currencies. This culminated in 2008 with the launch of Bitcoin, by the elusive Satoshi Nakamoto, to a cryptography mailing list. Nakamoto has since disappeared, no one has ever met him, no one knows whether he is the pseudonym of one of the cypherpunks, and if so, which one. Following its release Bitcoin experienced a period of organic growth with cryptography enthusiasts and the technically curious. With the Bitcoin currency growing an ecosystem started to grow around it beginning with more user-friendly routes to accessing the blockchain – wallets to hold your Bitcoins, digital currency exchanges and tools to inspect the transactions on the blockchain. Bitcoin has suffered reverses, most notoriously the collapse of the Mt Gox currency exchange and its use in the Silk Road market, which specialised in illegal merchandise. The Mt Gox collapse demonstrated both flaws in the underlying protocol and its vulnerability to poorly managed components in the ecosystem. Alongside this has been the wildly fluctuating value of the Bitcoin against other conventional currencies. One of the early case studies in Cryptocurrency is of women in Afghanistan, forbidden by social pressure if not actual law from owning private bank accounts. Bitcoin provides them with a means for gaining independence and control over at least some financial resources. There is the prospect of it becoming the basis of a currency exchange system for the developing world where transferring money within a country or sending money home from the developed world are as yet unsolved problems, beset both with uncertainty and high costs. To my mind Bitcoin is an interesting idea, as a traditional currency it feels like a non-starter but as a decentralized transaction mechanism it looks very promising. The problem with decentralisation is: who do you hold accountable? In two senses, firstly the technical sense – what if the software is flawed? Secondly, conventional currencies are backed by countries not software, a country has a stake in the success of a currency and the means to execute strategies to protect it. Bitcoin has the original vision of a vanished creator, and a very small team of core developers. As an aside Vigna and Casey point out there is a limit within Bitcoin of 7 transactions per second which compares with 10,000 transactions per second handled by the Visa network. It’s difficult to see what the future holds for Bitcoin, Vigna and Casey run through some plausible scenarios. Cryptocurrency is well-written, comprehensive and pitched at the right technical level.